“Aluminum Man” No one can….Like Aluminum can…. Man!! The possibilities are endless, but, of course, ruined now that someone stole my idea even before I had it! How do they do that? It’s dastardly, I tell you, dastardly.. I just LOVE the interesting byroads your nimble mind chooses to wander! Thank you for traveling those byroads with me. When I was a child, my mother often said, “Finish your sentence and stop playing with your words!” I bet your mom said the very same thing. Have you noticed how some words leave you still hungry (like Chinese food) while others leave you feeling completely satisfied? My dad always told me, ‘Exit, stage left!’ not in a nice way, when I got too wordy. I was having great fun last night melting alumInIum tea-light tins to slag in my roaring coal fire. So…maybe the European version of The Man is a bit soft? I’ve never tried melting aluminum. Please don’t give me any ideas. Amazing, I had completely forgotten about tin foil till you mentioned it. I think the chief advantage of aluminum is that it is so light… but as you say, it has a lot of advantages. We use it mainly for a covering when cooking or for wrapping food on the barbecue. My mother always used to refer to aluminum foil as “tin foil.” Now I know why. She used to reuse and reuse one piece until, hard to believe, that initially shiny, flexible sheet became not only wrinkled but hard as a rock! Does anyone else remember this? 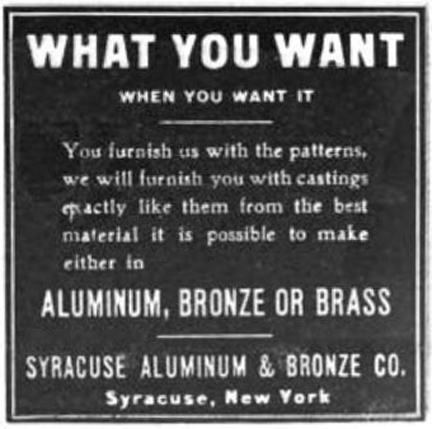 Final note: Of course your ad came from a company in Syracuse! I would ask the biblical question: Can anything good come from Syracuse? Except, I came from Syracuse; so clearly it’s possible. On the other hand, as soon as it was legal, I also LEFT Syracuse. Has anyone ever been through a Syracuse winter? Six months of grayness, as if you’ve been shut up in a box with very little sense of air space. Respiratory diseases flourish. I won’t even mention the cold or the snow. The grayness is enough to make you want to get on your cast iron/copper/aluminum broom and fly far, far away! My mom called it tin foil, too. The language remembers better than people do. Your mom sounds like a woman after my own heart. I like to reuse things, although I’ve never used a piece of foil more than twice. Would you say Syracuse has an aluminum gray about it. Wisconsin winter days are like that as well. My most clear recollection of aluminum is that I could not pronounce it correctly as a child. That and the word “animal” were quite challenging to me. So of course, I used “tin foil” as a substitute. It is so much more descriptive. I was forced to figure out how to say “animal”. as there are fewer easily pronounced substitutes for that word. This entire post made my teeth hurt. It’s always endearing when children say “aminal” instead of “animal.” I wonder if the British pronunciation for aluminum, aluminium, would have been easier to say. I was just reading out your post to my husband, mainly for the bit about the internet as he is always looking for other people who are as underwhelmed as he is about it…but, as soon as I mentioned aluminium he reeled off lots of useful information and facts – can’t recall it now as am 50 – but suggested that the major company in the US who produced it after the war (Kaiser, apparently) should have invented Aluminum Man. How do they know these things?? I love tin foil, I’m particularly fond of wrapping a sandwich in it. Foil, I think, is a bit like duct tape; it’s useful for many things. Maybe that’s why your husband knows so much about it. For sandwiches I love waxed paper, probably because that’s what my mother used. Ah, yes duct tape or as we call it gaffer tape. My left hand indicator has been stuck on like this for quite a few months! Am I the only dinosaur who still calls it “Tin foil”? It’s just like texting in the kitchen. I think a lot of people people call it that because it’s what their mommy dinosaur called it. I am a Zuniceratops, although I’m taller than the average one. What are you? Irishasaurus Rex. It’s best not to cross me. If he replaces the Tin Man, does your Aluminum Man have a heart, or is he just alumi-numb? I love “alum-numb.” Brilliant. And shiny, too. Aluminum is the third most abundant element in the earth’s crust, ranking only behind oxygen and silicon. Perhaps Aluminum Man is really a common man, and therefore doesn’t qualify for superhero status! See. Wouldn’t you love a superhero made of aluminum saying that?